I'd love to add more environments like that, but it's currently on the back-burner due to my other commitments. If/when I get time to work on this asset pack series, another character pack will be next up before anything like that. There aren't any colour restrictions for this asset pack, so the palette is quite... expansive, haha. I don't think it would be very useful at its current monstrous stage (you may as well be picking from the basic colour picker in your image editor at this point). If you like the colours I'd treat it like a non-pixel art image and find the colours you like and try to mimic it. It's been a while since I've tinkered from Unity, but from memory there are couple different places you can affect animation speeds for tiles. Easiest way is to adjust the animation frame rate of the entire tilemap (just double check your tiles are on the correct tilemap if it doesn't appear to change anything). You can also change the frame duration of the animated tiles one by one.. Could be a bit tortuous that way but possible. I'm not a unity expert by any means, so hopefully that helps! Woops! Thanks for letting me know. No, it isn't. Sorry! I need to refresh my memory on what needs to be done, but due to RPG Maker MV's restrictions I think it will need quite a bit of editing to work. 2 tile high walls are possible with this set. The tutorial covers this very lightly (just some example pictures - check the 2+ story section). But I recommend looking closely at the example scene (blue roof building) to see how these tiles can be used like that. Thanks for this comment! Next tileset will definitely be compatible. I've been wanting to do another character pack for a long time, so that might come first (and will include female heroes for sure). Thank you very much for purchasing! I enjoyed drawing the furniture a lot! I will be adding more furniture to future tilesets, but the next tileset will probably be more outdoor areas... it could be a while away! Creating a 32x32 version would best be done starting from scratch, so I don't have any plans to do this, sorry! I would like to do another outdoors tileset (with cliffs, water, a variety of trees, and maybe farm-related things) before I move on to other settings. I won't decide for sure just yet though. I made sure the projection is all consistent (although sometimes design / tile efficiency takes preference over that). I think what may be throwing it off for him is that the walls (under layer) are already 'sliced' quite low so that they take up exactly 1 tile without overlap. The roof tiles are not only just adding the roof, but also draw the rest of the wall that has been hidden. Had to do it like this for it to fit with other existing tiles (like the door frames). Released the 3rd tileset in my RPG asset series last night. Phew! This is a 16x16 tileset for creating villages. Includes plenty of documentation and examples using Tiled (with terrains set up). I'm trying to capture a warm, charming, fairy-tale feel with these assets. If you feel it might suit a prototype or project of yours, please take a look! Hi! It can fit buildings as small as 2x4 tiles (including walls). 5x4 tiles if you actually want to fit a door on it. Hello! I've just released my second tileset in my WONDERDOT series of RPG assets. This is an overworld tileset using 16x16 pixel tiles. 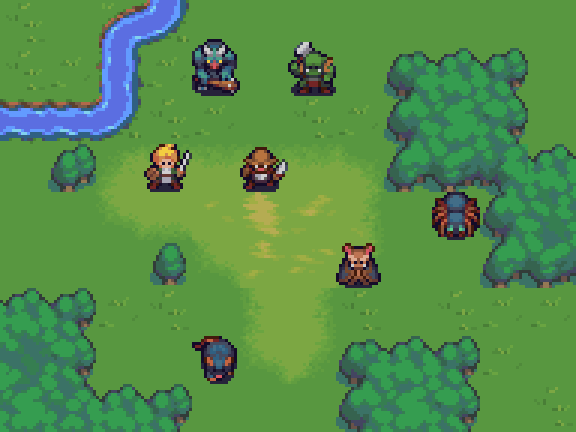 I'm looking to capture a classic JRPG/SRPG feel, with warm and clear colours and a cute, classic aesthetic. My main inspirations are the Shining Force & Fire Emblem series. If you think assets of this nature might suit a project of yours please check it out! Hello! I've just released the first package in what I hope will be a long-running and expansive collection of game assets. It includes a dungeon tileset and two fully animated characters. Ideal for SRPGs, but since it has walk, hit, attack animations in each direction, you could easily create an action game, traditional RPG, or roguelike with these graphics.